Pet Case Study: Socks B.
Socks B. is now an 11 month old, male, neutered, domestic shorthair. At the time of his first visit to ADRC he was a mere five months old. At that time he had been fighting severe bacterial infections in his ears for approximately 6 weeks which were not responding to oral antibiotic therapy. The infections were actually secondary to severe skin changes including plaques on the ear tips and proliferative masses filling his ear canals. He was a quiet, lethargic kitten. The “before” photos illustrate how he was feeling and show the masses and a purulent to bloody discharge from his ears. Two major differentials were considered, infections secondary to a) necrotizing otitis externa b) with or without a viral etiology. 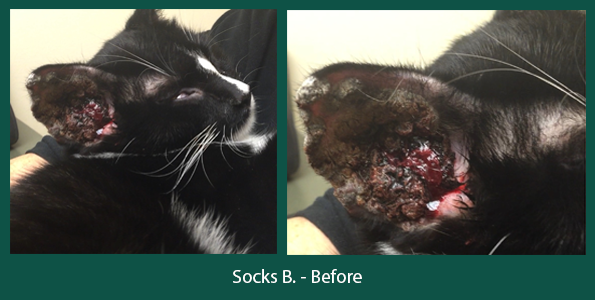 Socks was treated with daily, oral doses of interferon for viral papillomatosis. All animals have interferons naturally in the immune system. Interferons help us fight infections from bacteria, viruses and parasites. The interferon supplement helped boost Sock’s immune system. The mass like lesions had improved dramatically at his recheck exam 2 months later. There were no longer lesion on his ear tips and the masses had resolved in part of his ear canals. The “after” photos clearly show a kitten who is much brighter and more alert. Socks continues to receive daily oral doses of interferon and is scheduled for a recheck in the near future. The “after” pic clearly shows a kitten who is much brighter and more alert. 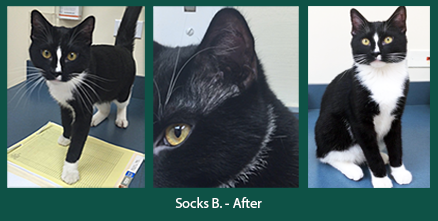 Socks continues to receive daily oral doses of interferon and is scheduled for a recheck in the near future.